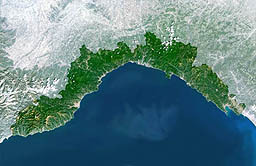 The Ligurian coast was inhabited by Neanderthals about one million years ago, and many remains have been unearthed in the area. The locals say they were lured by the beaches, which still exert a hold over the hundreds of thousands of tourists who flock to this narrow coastal region each year. Streching from the French border in the west to La Spezia in the east, the coast is dotted with resorts and medieval towns; the mountainous hinterland hides hilltop villages, the occasional piste and plenty of scope for walkers and climbers. Genova, regional capital and one-time sea power, is an important port and a muuch overlooked attraction in its right. Liguria has been ruled by the Greeks, Saracens, Romans, Venetians, Lombards and the French, and strong early trade influences from as far afield as Sicilia, Northern Africa and Spain are evident. Cuisine is marked by the products of the Mediterranean climate - fresh herbs, extra virgin olive oil and seafood. Among its culinary creations are pesto, focaccia and farinata, a chickpea flour bread. A visit to the Cinque Terreis not complete without trying its delicious but rare dessert wine, Sciacchetr�. 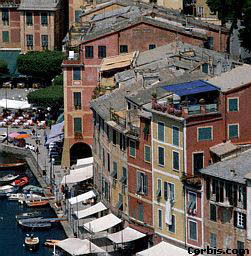 The Riviera di Ponente is also well known for its wine. A train line follows the coast from the French frontier to La Spezia and beyond, connecting all points along the way. By road you have the choice of good autostradas. City: Genova (GE); Imperia (IM); La Spezia (SP); Savona (SV).